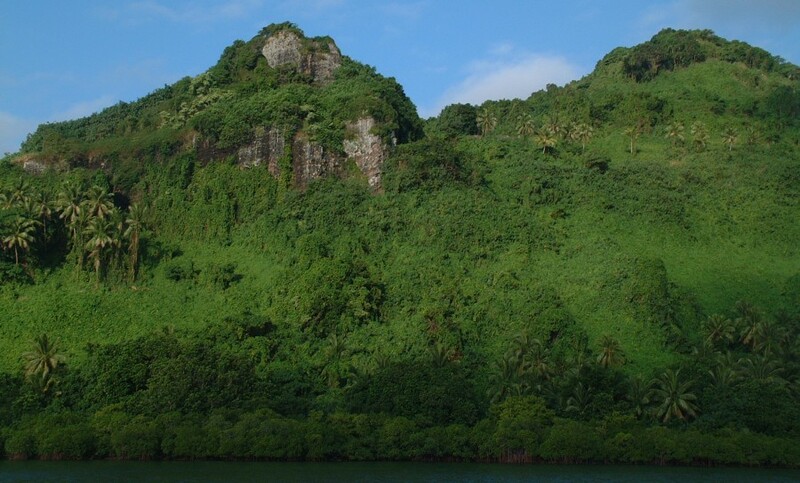 Landscape: Beqa and Ono are largest islands we visited south of Viti Levu. 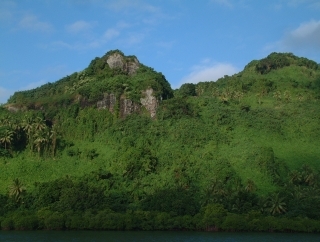 They are high islands, verdant with forest and coconut palms, and fringed in mangroves. Yanuca, Dravuni and the smaller islands inside the Great Astrolabe Reef have lower hills and white sand beaches. (Sue) Calm winds and seas meant we finally got a chance to stop inside the Beqa (pronounced BENG-ga) lagoon, an area we had passed several times in our journeys along the south coast of Viti Levu. After the commercialism of many of the other Fijian islands, it was nice to nose around uninhabited little Yanuca (ya-NOO-thah) Island where we dropped the hook in 25 feet of clear water over sand. The snorkeling was so-so, the coral being bleached a bit. But there were many small fish to be enjoyed. On Beqa itself we did not have time to explore the deep cove with villages on the western side (we have to save something for future visits! ), but instead pulled into Malama Bay on the northern shore. This is a beautiful deep inlet surrounded by dense mangrove forests, and enclosed in steep hills and high valleys. Very wild. Very impossible to get ashore! Although this looks like a calm anchorage, apparently the wind can charge down the valleys in heavy gusts creating one of those annoying nights where you drift off to sleep then are awakened over and over by the boat jerking up on its chain, then lying still again. We were lucky: in the very light winds the anchorage was flat calm. At the head of the bay is a small dive resort run by an American woman who is very unfriendly to yachts. She must be protecting the identities of her famous guests, or something. (Not that it looked all that classy!) What we didn't get to do inside Beqa Lagoon was to dive. According to the dive brochures, there is some great soft coral in here, and some lovely sights. Again, next time! About 30 miles south, in the Kadavu Group, inside the Great Astrolabe Reef we dropped the hook off uninhabited Namara Island, the closest island to the pass south of Dravuni Island. Tradition says we should have sailed to Dravuni, presented sevu-sevu to the chief and asked permission to stop at Namara, but it was late afternoon and we were beat from the boisterous sail from Beqa. Once the hook was down we snorkeled ashore and enjoyed beachcombing for shells. (Jon) We had actually given up on ever visiting the southern islands. Once we left Suva to go north to Savusavu for Christmas, and then west to Lautoka, Beqa and Kadavu were straight upwind, and therefore too much trouble to get to. But in March, when our niece Emilia was visiting, the winds went absolutely flat calm, so we decided make a quick motor SE for a change of scenery. This area was featured in a recent National Geographic as having magnificent coral and undersea wildlife, so my expectations were probably too high. I enjoyed exploring the little islands we visited, but the snorkeling and diving were only so-so. Apparently, much of the area featured in National Geographic was in the far south, an area that's very difficult to get to. We had a glorious sail back to Suva, with the winds blowing a hard 25 knots from well aft of the beam. This was a bit strong for me to fly our spinnaker (it probably would have survived, but I don't like to strain our gear like that) but even under our normal working sail we were thundering along at about 9 knots. Earlier we'd noticed another sailboat exiting the reef about 30 minutes before us and I thought we'd catch them pretty quickly but I was surprised. The other boat did fly their spinnaker and walked slowly away from us, sailing into Suva harbor about 45 minutes ahead of us. When I called them on the radio later to congratulate them, they revealed that they were also a catamaran, but a light, fast, cruiser/racer design, so I felt a bit better. 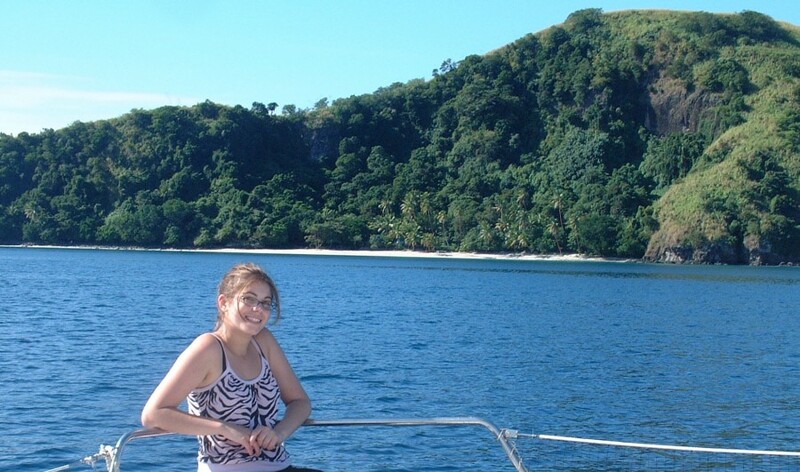 (Amanda) Emmy hadn't yet visited an authentic Fijian village, so that was one of our first stops in the Kadavu area. We went ashore and did a sevu-sevu ceremony, the first that Emmy and I were present at. It was a rather hurried affair, possibly even being done by a relative of the chief rather than the chief himself. Still, he accepted the yaqona and invited us to look around the village and the island as well as the neighboring islands, which the village owned. So we walked around, watching the kids play on the lawn, the chickens walk over the drying copra, the people go about their daily activities. Down at the far end of the village was a marine/oceanography research station for a Fijian university, which was currently empty, and the village's burial site. Emmy quickly got to know some of the village kids, and we were invited to visit the school the next morning. There were three classes - preschool, primary, and intermediate. 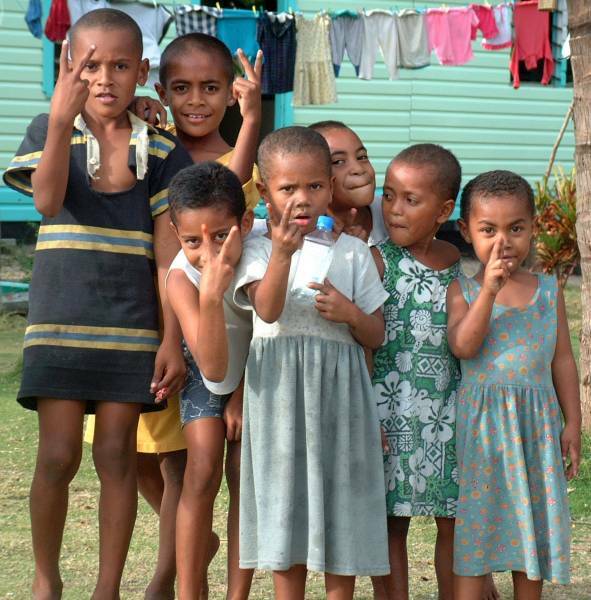 Kids in junior high or older have to go to Ono or Kadavu islands and board at school. Mom, Emmy and I spent all morning at the school, watching and interacting with the kids and teachers, and teaching a bit of English. The school's one (and, I think, only) computer was broken, so Dad came in later and dissected it for them (yes, he put it back together afterwards). 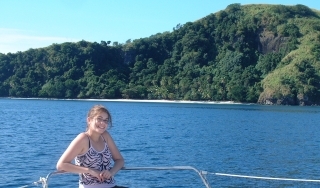 We anchored in a deep bay on Ono island, surrounded by tidal flats. The dinghy trip ashore required a half-to-full tide to get up the river, and was a bit iffy at the beginning, but we got the hang of it after a few trips up and down. Mom and Dad went ashore to do sevu-sevu, and found out it was the chief's nephew's 21st birthday the next evening - even better, we were invited to the celebration, along with the two other boats in the anchorage!